 Physical such as pollution, radiation (mobile phones, microwaves, electricity).  Emotions for example other people’s negativity: anger, jealousy, aggression etc, even if not directed specifically at us.  Spiritual such as unwanted spirits attaching to us and varying degrees of nasties, false masters etc. It must be remembered that it is always something within our makeup that attracts these energies to us and there is a lesson to be learnt from them. The higher we go in our meditations the greater the attraction towards this light from all forms of energy. We must therefore always be aware of protecting ourselves when meditating and often when not in a meditative state as well, especially as we become more spiritually aware.  Remain grounded at all times (see grounding information).  Closing down your chakras regularly, even if not meditating. Chakras have a habit of opening all the time; they do not naturally close themselves. Visualise them like flowers closing down into a bud.  Call on Archangel Michael to place his deep blue cloak of protection round you.  Call on the Gold Ray of Christ three times to protect you.  Visualise a cross in front, one behind, one above, one on either side and one below or another symbol of protection that you hold dear.  Visualise a bubble of protection.  Visualise a pure white ball of reflective light.  Say The Lords Prayer or another prayer that is meaningful, e.g. the Gayatri Mantra.  Visualise a pyramid surrounding you.  Use a protection invocation, e.g. I now invoke the angels of protection to surround me in a golden bubble of protection. 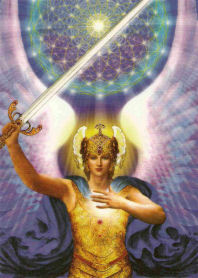 Only that which is of the highest and purest light may enter this space .I am totally protected. So be it. It is done. The protection you believe in is the most effective. Try some of the above and see which resonates with you most. You can use more than one method if you want to. 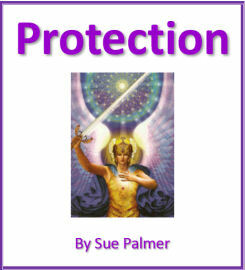 has a whole chapter on psychic protection, which makes interesting reading. If you would like to learn more about protecting yourself: different methods and exercises to try, you may be interested in downloading a free PDF copy of Sue's 'Protection' booklet. Can we over protect ourselves? My protection doesn't seem to works!